The origins of business strategy are found in military applications. Generals throughout the ages faced formidable challenges as they crafted plans to outmaneuver competing forces, acquire territory, and gain power. Similarly, business leaders also looked to outmaneuver their rivals as they entered new markets against entrenched competitors, secured a strong market position, and expanded their companies’ influence. Although the destructive aspects of war are not present in business, there is a reasonable parallel, such as the bankruptcies of once mighty companies, which resulted in layoffs of thousands of employees and the closings of numerous plants. Then, there is the devastating economic impact and societal disruption that creates demoralizing misery among large groups of individuals in once flourishing cities, such as Detroit, Michigan, as well as in numerous other once-thriving areas worldwide. Essentially, the intent of the book is to improve managers’ ability to think strategically. The further aim is to blend the timeless lessons of military strategy into business plans, with impact in grass-roots engagements with customers, as well as the inevitable clashes with competitors.In addition, readers can access a body of knowledge that has endured in written form and practiced by successful leaders for centuries. As such, managers will hold a competitive edge in an evolving digital-age marketplace. 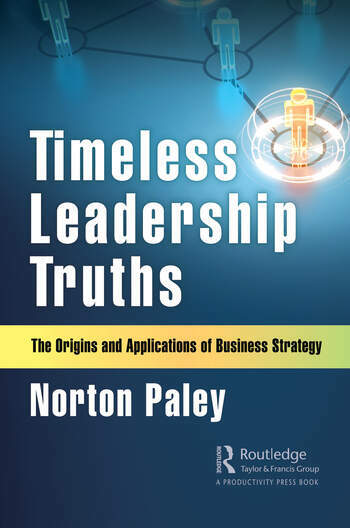 Norton Paley has brought his world-class experience and unique approach to business strategy to some of the global community’s most respected organizations. Having launched his career with publishing giants McGraw-Hill and John Wiley & Sons, Paley founded Alexander-Norton Inc., bringing successful business techniques to clients around the globe including the international training organization Strategic Management Group, where he served as senior consultant. Throughout his career Paley has trained business managers and their staff in the areas of planning and strategy development, raising the bar for achievement, and forging new approaches to problem solving and competitive edge. His clients include: •	American Express •	IBM •	Detroit Edison •	Chrysler (Parts Division) •	McDonnell-Douglas •	Dow Chemical (Worldwide) •	W.R. Grace •	Cargill (Worldwide) •	Chevron Chemical •	Ralston-Purina •	Johnson & Johnson •	Celanese •	Hoechst •	Mississippi Power •	Numerous mid-sized and small firms Paley has lectured in The Republic of China and Mexico and he’s presented training seminars throughout the Pacific Rim and Europe for Dow Chemical and Cargill. As a seminar leader at the American Management Association, he conducted competitive strategy, marketing management, and strategic planning programs for over 20 years. Published books include: •	Effective Leadership Strategies for the Digital Age •	Leadership Strategies in the Age of Big Data, Algorithms, and Analytics •	Developing a Turnaround Business Plan: Leadership Techniques to Achieve Change Strategies, Secure Competitive Advantage, and Preserve Success •	Clausewitz Talks Business: An Executive’s Guide to Thinking Like a Strategist •	How to Outthink, Outmaneuver and Outperform Your Competitors: Lessons From the Masters of Strategy •	Mastering the Rules of Competitive Strategy: A Resource Guide for Managers •	The Marketing Strategy Desktop Guide, 2nd. Edition •	How to Develop A Strategic Marketing Plan •	The Managers Guide to Competitive Marketing Strategies, 3rd Edition •	Marketing for the Nonmarketing Executive: An Integrated Management Resource Guide for the 21st Century •	Successful Business Planning: Energizing Your Company’s Potential •	Manage To Win •	Big Ideas for Small Businesses On the cusp of the interactive movement, Paley developed 3 computer-based, interactive training systems: The Marketing Learning Systems; Segmentation, Targeting & Positioning; and The Marketing Planning System. Paley’s books have been translated into Chinese, Russian, Portuguese and Turkish. His byline columns have appeared in The Management Review and Sales & Marketing Management magazines.